Did you know that there are things lying around your house that you can easily upcycle into gorgeous jewelry? Want to be unique and stand out fashion-wise from your friends? Or are you simply the type of person who loves to keep old materials and knick knacks around, knowing that there will come a time when they can be put to good use? If you answered yes to any of those questions, then I suggest you read on! I've collected unique and totally awesome ideas for repurposed bracelets. Follow the tutorials and you'll be a DIY fashionista in no time! Try this DIY Hex Brass Bracelet Kit to jump start your crafty spirit! Indulge your creative side with a DIY necklace or bracelet that defies expectations. Make extraordinary handmade jewelry from the most ordinary of items — and rock it like it’s high-priced bling! Order it here today. Turn your awesome shirt into an awesome bracelet. Watch the video tutorial at diyncrafts. Craftiness can be just a trip to the garage. 🙂 Follow the tutorial here. I can't wait to look for spare or unused washers in my husbands tool box! Check out the idea here. Who said that safety pins are just for emergency? Is this diy bracelet totally rocks?! Tutorial via redflycreations. A fun DIY craft that your kids and tweens will love. Explained in depth by mollymoo. Who knew you could make something so fancy from ordinary old soda cans? Follow the video tutorial at DIY&I. Cute, simple and funky! Check out the tutorial here. You only need to take one trip to the thrift store and exercise your imagination to make these fancy looking leather cuffs. Check this idea out at thesitsgirl. Don't throw those soda tabs away again! Find this upcycled masterpiece here. 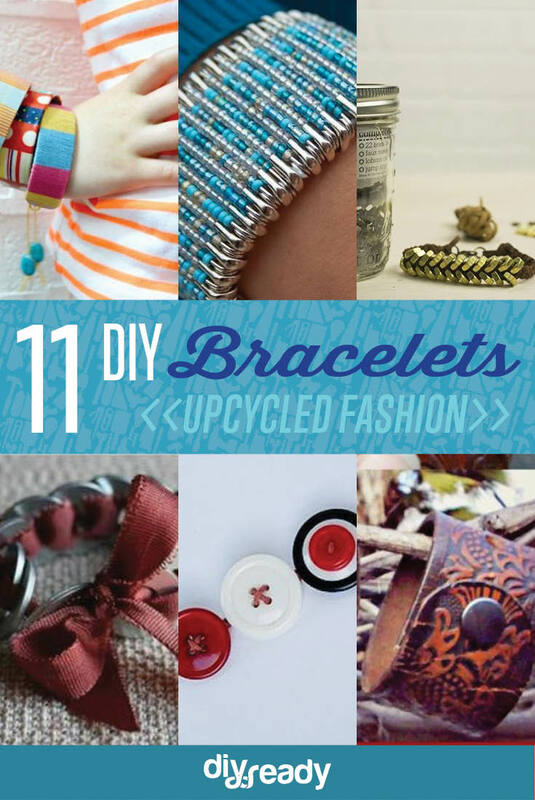 Excited to get started on your first upcycled bracelet? Try this great DIY kit — it has everything you need to make a gorgeous hex nut bracelet. Great option for beginners! Order here.